There's a common argument that if the Wall won’t stop all illegals, we shouldn’t stop any of them. Under that reasoning, we shouldn’t arrest any rapists or murderers, because we can’t convict all of them. Emotions above reason make people silly. People can tunnel, cut and get over/around the wall. But that doesn't mean you shouldn't have the Wall. It means you should arrest the people that would break our security. Like all barriers, it alone can't be effective -- but it is required to be part of a broader security plan. The facts are that while many or even most illegals, are first timers that just came on a vacation and overstayed. I don’t really care about them. Once they’re arrested and deported, they can’t come in legally through the border, and they have to use coyotes or the desert path. So the bad hombre’s use the fence path — and the wall works against them (and raises their costs). As well as drug smuggling and human trafficking. 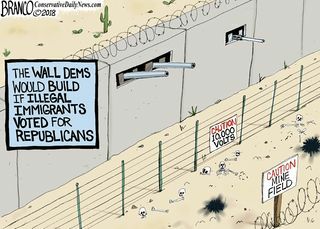 So the wall may not be effective against ALL illegal immigration, or even most -- but it stops the worst elements first. So it's not a cure, but it is an aid in a cure. Those saying otherwise are too ignorant/dishonest to discuss this topic with. If you had a miserable disease, would you take medicine that doesn't end the disease, but helps with the worst symptoms? That's what the Wall does. This page was last edited on 26 February 2019, at 21:40.